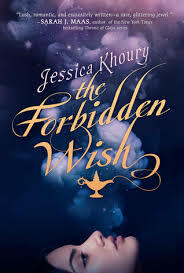 Forbidden Wish by Jessica Khoury – I read a sample of the first few chapters of this book and definitely want to read the rest. In fact, I don’t know why I haven’t bought it already or at least tracked down a copy through the library. The City of Ember (The First Book of Ember ) by Jeanne DuPrau – I know almost nothing about this series, except that one of my closest friends (and one of my only friends in real life who reads YA and admits to it) LOVES this book. And that, my friends, is good enough for me. I trust her. Even though she did not like Cry, the Beloved Country, which made me cry inside just a little bit. 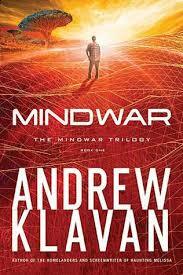 Mindwar by Andrew Klavan – Strangely, I’ve only read the third book in this series, but I really enjoyed a lot of things about it. It gave me things I wanted from Ready Player One. I liked the characters, too. 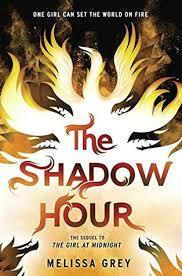 The Shadow Hour by Melissa Grey – I’ve been absolutely pining for this book since I read The Girl at Midnight. And it’s finally here! The Girl at Midnight definitely reminded me of Daughter of Smoke and Bone with its other-world and girl-out-of-her-world things it has going on. I loved the characters. Loved the story. Can’t wait for more. 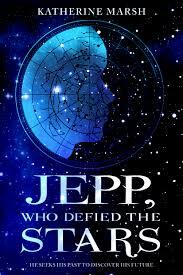 Jepp, Who Defied the Stars by Katherine Marsh – this book hit my radar when Katherine Marsh released another book called The Door By the Staircase, which also sounds great. Jepp deals with issues of fate, and I find myself desperate to know how his quest resolves. 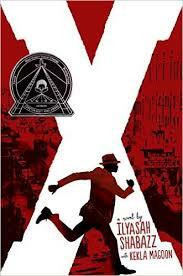 X: A Novel by Ilyasah Shabazz with Kekla Magoon – I forget where I first noticed this book. I think it might have been in a BuzzFeeds list or something. This is a novelized story about Malcom X, co-written by his daughter. Definitely interested in this one. 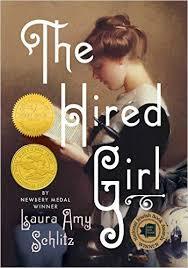 The Hired Girl by Laura Amy Schlitz – I might be the only person who hasn’t read this book. At least, that’s what I think whenever I see it, like, everywhere on the interwebs. Every time I read a historical novel I tell myself I should read them more often. I love the idea of reading a story set in the early 1900s about a girl who dreams of being more than a hired girl. Looks awesome. Must read. This Savage Song by Victoria Schwab – I’m a huge fan of the type of fantasy-scape described in the marketing copy. Also– the copy claims this is perfect for fans of Holly Black, Maggie Stiefvater and Laini Taylor? That’s me! (Okay, confession: I need to read Holly Black. Haven’t yet. But I will. Hopefully soon. but Stiefvater and Taylor are pretty sure bets for me.) Also I read some cool stuff on Victoria Schwab’s twitter page. That might be where I first learned about this book, actually. So, yay Twitter. 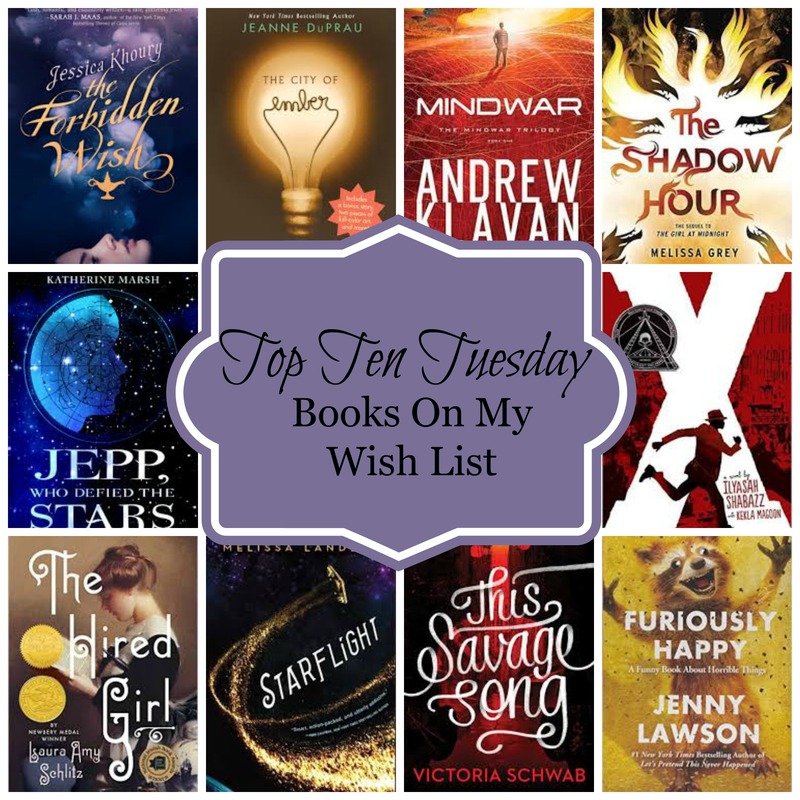 Furiously Happy by Jenny Lawson – I saw this on several must-read-type Top Ten Tuesday posts, and the description made me laugh so hard I almost had tears. Yes, please! There is never enough furious happiness in my life. Tagged Books to Buy, Top Ten Tuesday, Wish List. Bookmark the permalink. This Savage Song is really really good, I would definitely recommend it. The whole fantasy world and the monsters and just everything about it is perfect! Although once you’ve read it you will be in the same desperate situation as me wanting book 2 in your hands immediately! I really like the cover to Starflight. I haven’t read either Firefly or These Broken Stars (although I do have TBS) but I really like the sound of this one. Have added it to my TBR! Ack! I really want to read This Savage Song now!! Also– sorry… I meant Firefly the TV series. I should have specified! Thanks, Hannah! This Savage Song sounds so amazing! Thanks, Krystianna! Checking out your list, too. Ah I have This Savage Song! I can’t wait to read it! Thanks! I hope it’s as good as it looks! 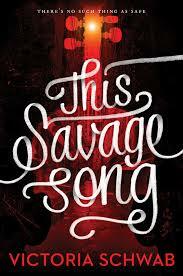 This Savage Song is on my TBR. I’ve seen a lot of people reviewing it but I completely forgot to add it to my list this week. 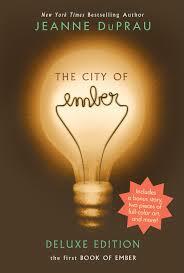 The City of Ember looks interesting too so I’ll add that one to my (ever growing) list. Happy reading and thanks for visiting my post earlier! Thanks, Amy. 🙂 I think that’s my favorite thing about the TTT posts – always hearing about new books! Great choices! I really enjoyed City of Ember (and the movie adaptation) but the sequels were pretty lackluster for me. 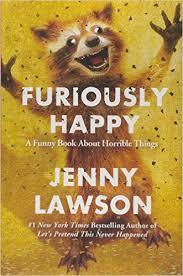 I borrowed Furiously Happy from the library and loved what I had a chance to read. I need to get my own copy so I can finish it. I’ll keep that in mind, Stacy. 🙂 I’m terrible about reading a series all the way through. I hadn’t thought to look for Furiously Happy at the library. Duh. I’m going to have to do that if it doesn’t make the cut! The hard copy version is still pretty expensive. Will check out your list, too. 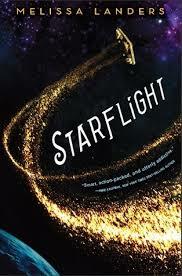 I have Starflight, just haven’t read it yet. I really liked This Savage Song and I do want to read Furiously Happy. I hear you, Kate. I have a stack of books by my bed that I desperately want to start reading. Maybe if I scale back the number of new requests I can get through them faster. Too many books to read!! You are amazing that you know enough of the market out there to have a wish list. Good on you, mate!!!! Hahaha! Thanks, Colleen. 🙂 I used to think the more I read, the more accomplished I’d feel. Instead it only makes me realize how many more great books there are out there. Too many to buy them all, that’s for sure!